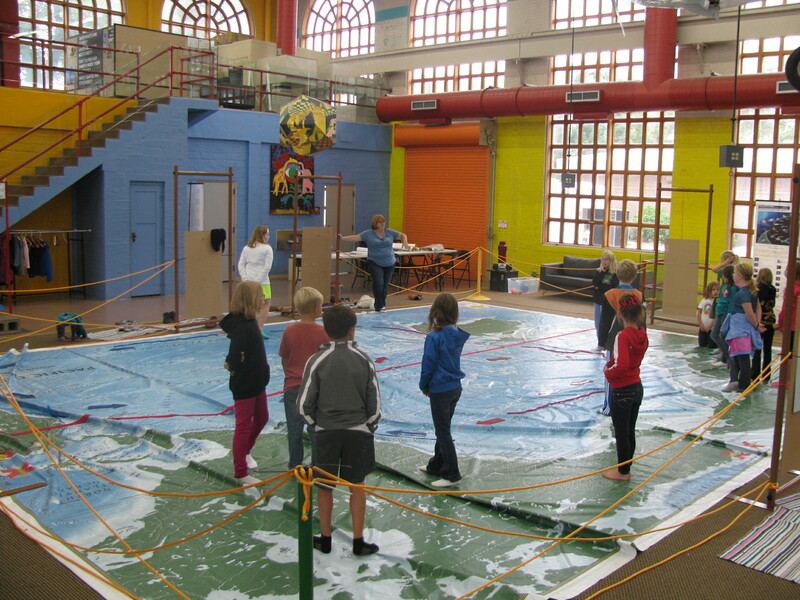 Environmental educator Anne Lewis brought National Geographic’s Giant Traveling Map of the Pacific Ocean to the South Dakota Discovery Center for their annual Water Festival. How did Anne get 4th graders thinking about water through the lens of geo-education? Through some feet-on activities. Kids in Pierre, South Dakota enjoy National Geographic’s Giant Traveling Map of the Pacific during the 2014 Water Festival. Photograph by Becky Kitts. I had to agree. We had just rolled out the 26′ x 35′ Giant Traveling Map of the Pacific Ocean from National Geographic and were marveling at its footprint. The map took up a good chunk of the main exhibit floor space in the South Dakota Discovery Center in Pierre. 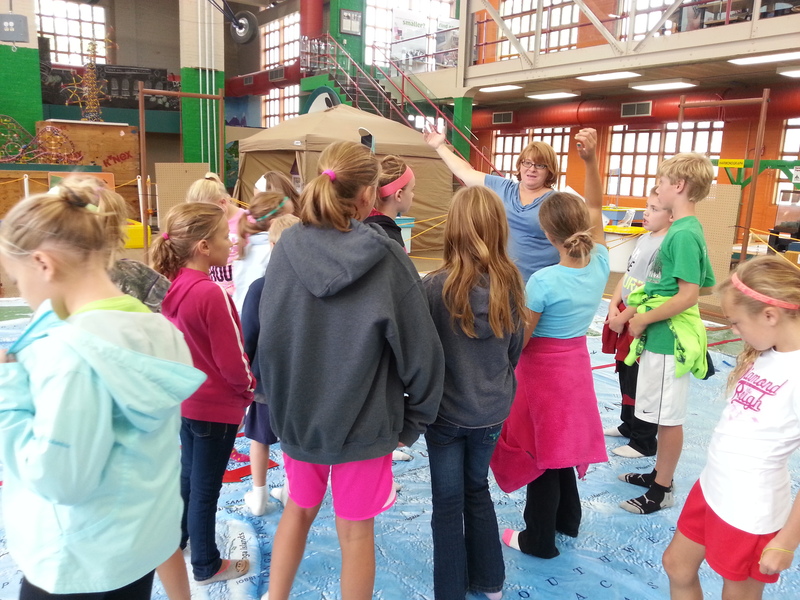 …few students in South Dakota have firsthand experience with the ocean. We brought in the map for our annual Water Festival, which takes place each year in late September. During the Water Festival, 4th graders from the area come to the science center to learn about different aspects of water through hands-on activities. Although every year is slightly different, our goal is to be as cross-curricular as possible. In the past we have used water to teach civics, earth science, ecology, health, language arts and history. And this year, thanks to the map, we added geography to that list in a big way. Kristie, a staff member at the South Dakota Discovery Center, teaches about ocean currents using a Giant Traveling Map. Photograph by Becky Walsh. We chose this map because few students in South Dakota have firsthand experience with the ocean. Landlocked South Dakota is over 1,000 miles from the Pacific Ocean. The Pacific’s breadth is hard to explain to students whose main experience with endless expanse is prairie grassland. The Giant Map conveyed the sheer size of the Pacific in a way no other map can. The National Geographic teacher guide enabled us to make the most of its time with us. Among the large selection of activities and topics to use, we chose a topic and related activity that was new to the Water Festival: ocean currents. In the activity, students walked the ocean currents on the map to learn about how and why the currents move. We also discussed the Great Pacific Garbage Patch by introducing plastic trash into the current (a bag carried by a student). This demonstrated how plastic trash moves through the ocean. Facilitated discussion and questioning unpacked how trash gets in the ocean, what happens to trash while in the ocean, and strategies to ameliorate the problem. Even though reducing, recycling, and properly disposing of plastics in South Dakota does not keep trash out of the Great Pacific Garbage Patch, it does keep trash out of the Gulf of Mexico. 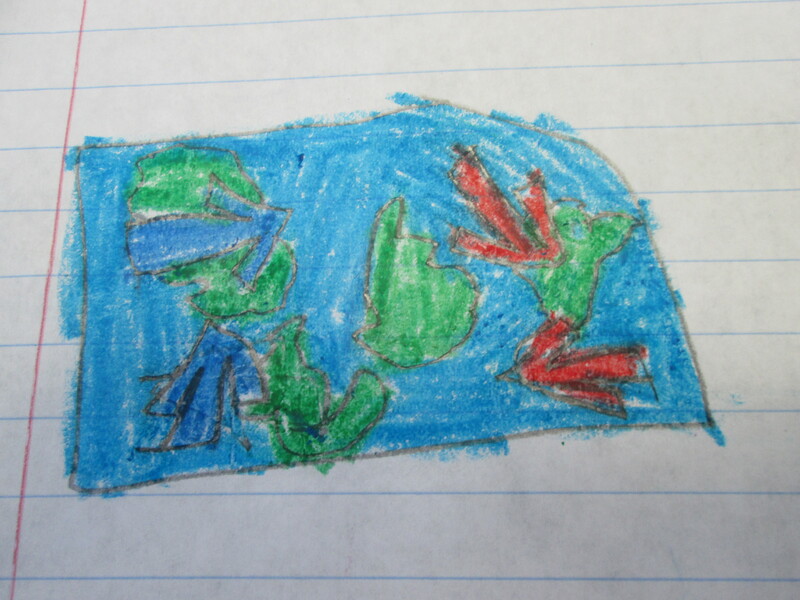 Student artwork shows a developing understanding of warm and cold water currents. Photograph by Anne Lewis. Discussing solutions was especially important to us. In presenting environmental problems to students, we are always mindful of being age appropriate. At the 4th grade level, students can be given a sense that they can take action to address these problems. At the end of the activity, we discussed proper disposal of trash, recycling, and reducing plastic use. Even though reducing, recycling, and properly disposing of plastics in South Dakota does not keep trash out of the Great Pacific Garbage Patch, it does keep trash out of the Gulf of Mexico. Just as important, it supports a social norm of responsible environmental behavior. This activity brought geo-education to life as students explored how physical, biological, social, and technological systems interact and impact each other. Geo-education and its outcome, geo-literacy, are essential for preparing students to thrive in a world that faces multiple complex challenges such as the Great Pacific Garbage Patch. Opportunities abound to integrate this mindset into the classroom. Sometimes these opportunities are small and other times, like this time, they are giant! This post was written by Anne Lewis, special projects director at the South Dakota Discovery Center in Pierre, SD. In this capacity, she coordinates South Dakota Project WET and the Leopold Education Project, administrates a small grants program, and gets to take teachers into the field as part of professional development. She is also part of the Geo-Educator Community Steering Committee. The Geo-Educator Community is a community for educators committed to teaching about our world. To learn more and join, visit www.geo-education.org. Giant Traveling Maps of Africa, Asia, Europe, North America, South America, and the Pacific Ocean are available for rent. Find out how to bring one to your school or community. Reblogged this on Environment Education Center of South Dakota.